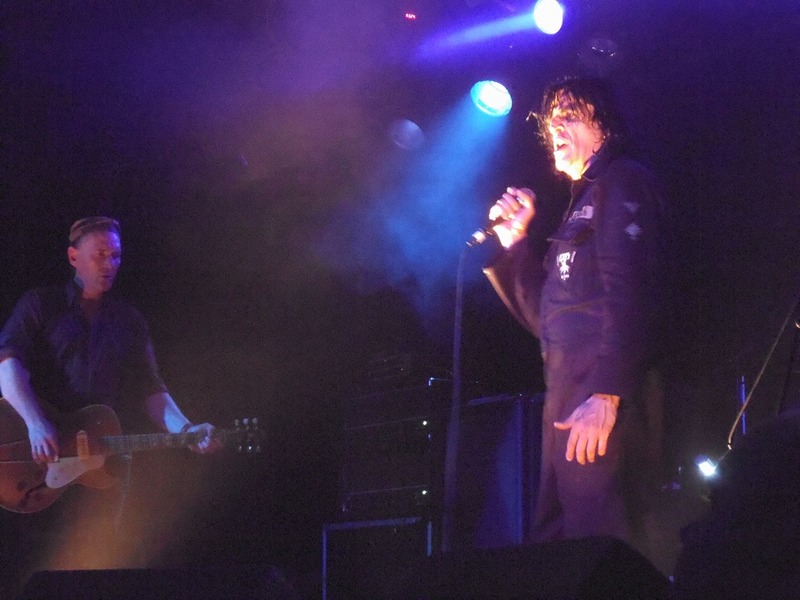 Killing Joke’s renaissance may have begun with their eponymous 2003 album, but they’ve shown little sign of slowing the momentum since. It’s fitting: they’ve always been the band of the apocalypse, and as humanity under global capitalism seems set on accelerating toward its self-made demise and ultimate destruction of the planet, so Killing Joke are the band to provide the soundtrack. If latest album Pylon is a little more accessible, melodic and less full-on than since of its recent(ish) predecessors, it certainly isn’t a sign they’re softening. 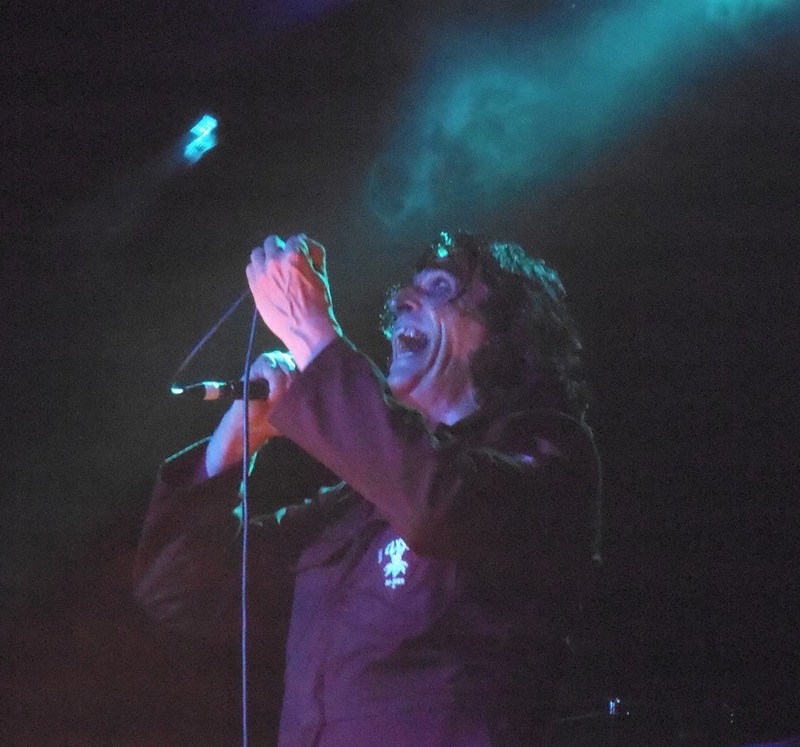 And while there are infinite angry, harsh bands out there, Killing Joke still offer a unique proposition – more articulate, both lyrically and musically than pretty much any other band you’ll find railing against the system and the man, their brand of heavy isn’t about raging overdrive, but something more impenetrable, industrial. And it’s live where the full force of their sound really comes across. Never mind saving the oldies for the end: the set opens with ‘The Wait’ before they get swiftly to the new material, hammering out the bleak ‘Autonomous Zone’. Immediately, the power of the original lineup is apparent: they’re tight, assured and seriously loud. ‘Eighties’ is also thrown in early, providing some light relief and cause for a fair few down the front to bounce around like it’s still 1985 (and yes, I was nine when this album was released: seeing them on Top of the Pops was my first introduction to the band, and even then, I was intrigued and scared in equal measure). Like another of my all-time guitar heroes, Swans’ Norman Westberg, Geordie Walker doesn’t go for heroics. No fancy fretwork. No posturing. As unassuming a performer as you’re likely to see, strolling – it’s not even a pacing, that would suggest some kind of agitation – a small space near the edge of the stage, he peels off layer upon layer of churning, sheet-metal guitar noise. Its power lies in the sheer density of the sound. Youth, sporting a crumpled white blazer, buttoned, and a sun visor over which tufts of thinning, matted hair stick, is similarly un-showy in his presence, rocking back and forth and grinding out bowel-shaking basslines that weld perfectly to Paul Ferguson’s thunderous drumming. I ponder, briefly, the number of albums the members of this band are credited in some capacity, Youth in particular with his vast catalogue of production and remixing credits. I also can’t help but be amazed that a band comprised of four middle-aged blokes (and a younger dude on synths) should be one of the most vital and relevant acts I’ll get to see this year. Jaz Coleman provides the focal point, of course. 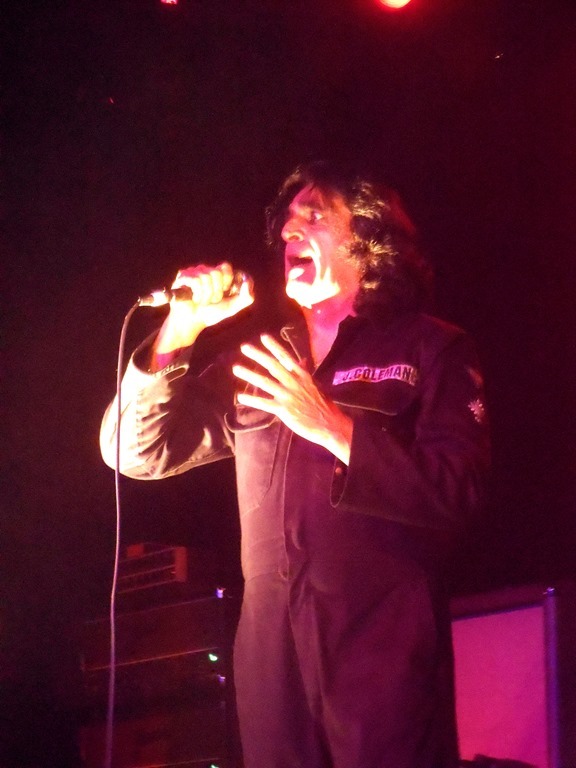 Sporting one of his customary boiler suits, hair grown long, he is the embodiment of the manic messiah. It’s often hard to tell if he’s grinning or twisting his craggy face into a terrifying grimace – both are equally scary, and he doesn’t do between-song chat. He’s wired, dangerous, focused. He doesn’t sing the songs, but channels them. He is the virus. He is a ball of fire, coming in from the void. And yes, ‘Asteroid’ is fierce, relentless, explosive. But then, the set’s brimming with highlights from the back-catalogue. Extremities, Dirt and Various Repressed Emotions has long been a favourite of mine, and to hear ‘Money is Not Our God’ attacked with such ferocity was truly exhilarating, and ‘The Beautiful Dead’ was also a welcome inclusion. Meanwhile, ‘Exorcism’ was nothing short of immense, the absolute definition of catharsis. ‘Wardance’ and flipside ‘Psssyche’ inevitably pleased the faithful, the latter wrapping up the main set. They’d saved ‘Love Like Blood’ for the encore (having seemingly dropped it for a number of previous shows, if the info on setlist.fm is accurate), but not until they’d powered through ‘Turn to Red’. Wrapping up with a powerhouse rendition of ‘Pandemoneum’, the refrain ‘I can see tomorrow / I can see the world today’ resonating as vindication of the band’s existence and continued rejuvenation. Coleman and Co aren’t sitting back smugly saying ‘I told you so,’ and instead remain intent on spewing vitriol against capitalist greed and environmental destruction, but the pre-millennium tension of their 90s releases seems devastatingly prescient in same the way JG Ballard’s texts portrayed the future by scrutinising the present. That future is now upon us.